Consumers across the country are burdened by credit card debt. A recent report from ValuePenguin found that 38% of U.S. households have credit card debt that they need to pay off. Among households who carry a balance from month to month, the average credit card debt is around $16,048. And those with the lowest net worth have the highest credit card debt burden, on average. 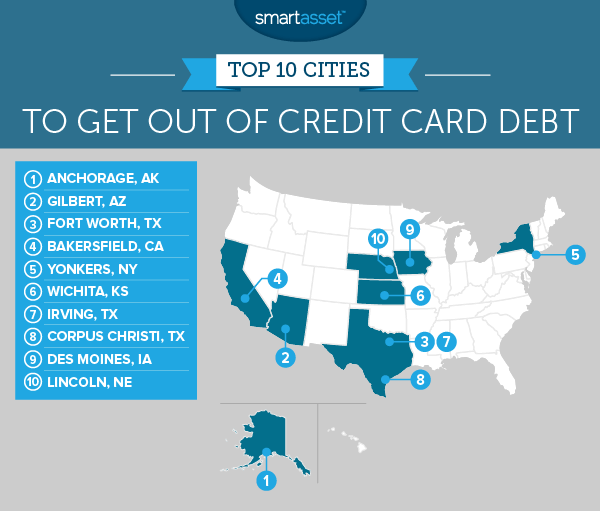 This is SmartAsset’s second annual study of the best cities to get out of credit card debt. Check out the 2016 version of the study here. For many people, getting out of debt is an ongoing battle. And depending on where you live, achieving debt freedom may seem impossible, especially if your city has a high cost of living. SmartAsset wanted to find the best places to get out of credit card debt. We looked at 63 cities with a population of at least 200,000 and calculated how long it would take to pay off $5,323 in credit card debt. That was the average debt burden per borrower in the third quarter of 2016, according to TransUnion. Our analysis is based on the assumption that a typical consumer spends half of their disposable income on credit card debt payments after paying taxes and covering the cost of housing and other living expenses. Our calculations are also based on the average annual income for workers in each city with only a high school diploma. To find out where our data comes from and how we put it together, you can read the data and methodology section below. See how long it’ll take to pay off your credit card debt. Anchorage is No.1. For the second year in a row, our analysis reveals that Anchorage is the best place to pay off credit card debt. Four other cities in the top 10 were also among the best cities to get out of credit card debt in our 2016 study: Bakersfield, California; Yonkers, New York; Wichita, Kansas and Lincoln, Nebraska. Costly California. Getting rid of debt isn’t easy for many residents in the Golden State. Based on our calculations, seven cities in California – including Irvine, Santa Ana and Los Angeles – are some of the worst places to pay off credit card debt. After paying taxes and covering the cost of housing and other essential expenses, many high school graduates can barely afford to pay off their debt. Anchorage is one of the richest cities in America. The median annual income across all households in the municipality is $78,662, according to one-year estimates from the 2015 American Community Survey. Even high school graduates make quite a bit of money. Among adults with only a high school diploma, the median annual income in Anchorage is still relatively high ($37,422). That’s one reason why paying off $5,323 in credit card debt – the average debt burden per borrower – could take roughly six months. Racking up credit card debt in Gilbert, Arizona may be unavoidable for some residents, especially since the state of Arizona has one of the highest sales tax rates in the nation. But property tax rates and income tax rates in the state are relatively low. So taxpayers may be able to pay off their debt fairly quickly. We estimated that with a monthly credit card payment of $815, high school graduates could pay off the average amount of credit card debt in less than seven months. Fort Worth is the fifth-largest city in the state of Texas and the median annual income for high school graduates is $30,697. That’s 13% higher than it was last year. Based on our analysis, a Fort Worth resident without a college degree could potentially pay off $5,323 in credit card debt in just under seven months. Bakersfield has about 373,627 residents. According to one-year estimates from the 2015 American Community Survey, 30% of the city’s adults between the ages of 25 and 64 have either high school diplomas or the equivalent of a regular diploma and no further education. Our study suggests that it may take a high school graduate a little more than seven months to pay off their credit card debt, if their monthly payment amount is around $790. Yonkers is roughly 20 miles away from New York City, by car. Census Bureau data reports that a quarter of the renting population in the city spends $855 per month on rent, or less. While renting in Yonkers is hardly affordable, adults who only have high school diplomas can make enough money to cover the cost of their living expenses and bills. The median annual income for high school graduates is $35,616. For residents who are willing to spend at least 50% of their disposable income (their income after paying for taxes and housing) on debt payments, we found that it’s possible to pay off the average amount of credit card debt in a little over seven months. In our 2016 analysis, Wichita was the eighth-best place to get out of credit card debt. This year, it claims the sixth spot on our list. The lower quartile rent for the city is just $429 per month and the estimated federal, state and local tax burden in Wichita is $4,340. After paying taxes and covering the cost of housing and other living expenses, many Wichita residents have plenty of money left over that they can use to pay down their debt. The median annual income for adults in Irving who only have either a high school diploma or its equivalent is $30,348. That’s higher than the median income for high school graduates in Dallas, Houston and Austin, which just so happens to rank as one of the best cities for college graduates. Based on taxes, income and living expenses, we concluded that it would take seven and a half months to pay off $5,323 in credit card debt, the average amount of credit card debt per borrower nationwide. Folks in Corpus Christi pay fewer taxes than most people across the country. Their federal, state and local tax burden is roughly $3,688. That means that after paying for taxes, housing and other essential expenses, high school graduates who earn around $28,216 annually could afford to pay off their credit card debt in less than eight months (based on our analysis). Sometimes finding a job can be tough for adults who don’t have college degrees. In Des Moines – where major industries include bioscience and financial services – the unemployment rate for adults with only a high school diploma is 8.8%, according to five-year estimates from the 2014 American Community Survey. High school graduates who are employed earn around $30,389. That’s the median annual income for these individuals. If they’re committed to spending at least half of their disposable income on credit card payments, Des Moines residents with high school diplomas could pay off the average amount of credit card debt in 7.59 months (seven months and about three weeks). The capital of Nebraska is the second most populated city in the state. 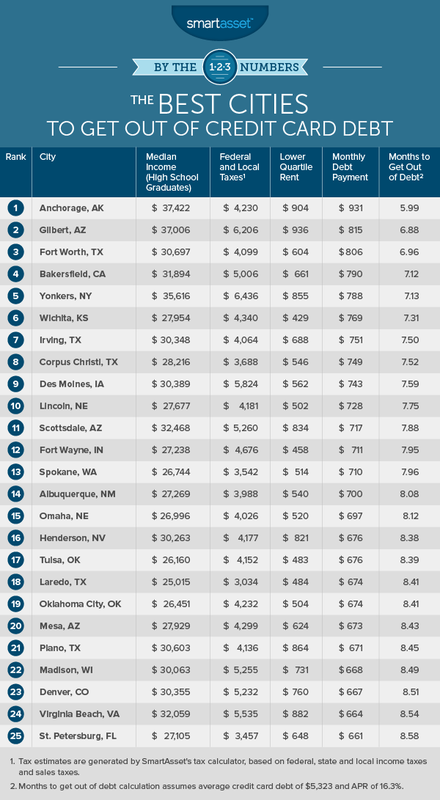 For the second consecutive year, it rates as the 10th-best place to pay off credit card debt, in part because it’s an affordable place to live. We concluded that a high school graduate who makes around $27,677 could get rid of their credit card debt in seven months and about three weeks. Our study looks at the best places to pay off credit card debt. We collected data for 63 cities across the country with a population of at least 200,000. Specifically, we used one-year estimates from the U.S. Census Bureau’s 2015 American Community Survey (ACS) and pulled the median salary for high school graduates in each city. We excluded any city from our analysis with an above-average unemployment rate among high school graduates without any additional education, according to five-year estimates from the 2014 ACS. To complete our analysis, we calculated the amount of disposable income that a high school graduate could have in each of the cities in our study. Using the SmartAsset income tax calculator, we found the after-tax income for high school graduates. Then we subtracted the annual lower-quartile rent. The lower-quartile rent is the amount that one-quarter of all renters in each city pay less than and three-quarters of renters pay more than (based on one-year estimates from the 2015 ACS). Finally, we took the estimated disposable income for high school graduates in each city and used 50% of those amounts to calculate their monthly credit card payment amounts. Then we found the number of months that it would take to pay off $5,323 in debt. In the third quarter of 2016 that was the average credit card debt burden per borrower, according to a report from TransUnion, one of the three credit reporting bureaus. Our calculations are based on a couple of assumptions. We assumed that a consumer would have an APR of 16.3%. As of December 2016, that was the average annual percentage rate, according to Bankrate. We also assumed that 50% of consumers’ disposable income would be used to pay off credit card debt. Most households don’t devote that much money to paying off debt, but our analysis focuses on the folks who are seriously committed to getting rid of their credit card debt. Note that our study looks at a hypothetical situation for borrowers, based on averages. In other words, we did not consider how long it would take a certain person to pay off credit card debt. To figure that out, you would have to use a credit card calculator.